Stone Mountain Serenity - Amazing Views, close to Wine Country & Parks! 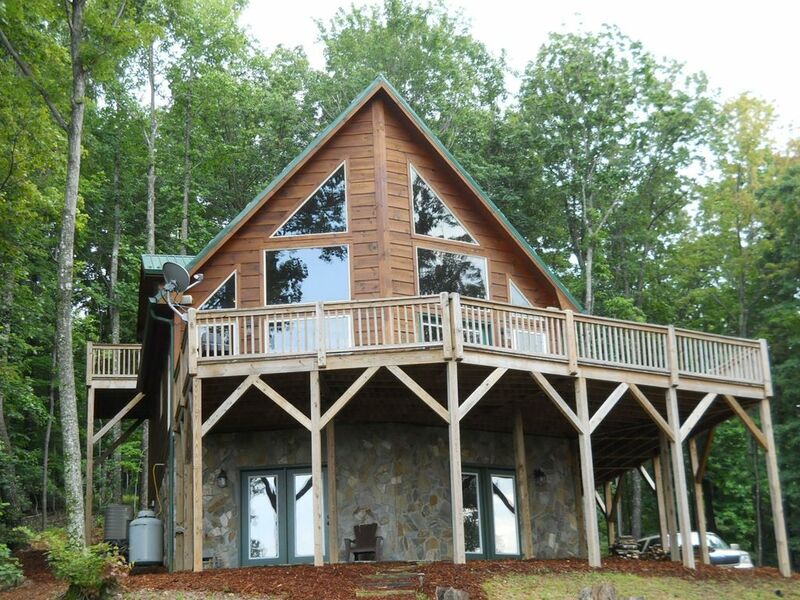 Located in North Carolina near Stone Mountain State Park, this spectacular 3 bedroom, 3 full bath, 2,500 square foot cabin on 5.5 private acres located in the beautiful gated community of Bell Mountain will astound you! Amazing long range views looking into the heart of Doughton National Park and the Blue Ridge Parkway. 5 miles to the back entrance of Stone Mountain State park and to the bottom entrance of Doughton park. Vacation in luxury with granite counter tops and vanity tops, stainless steel appliances, vaulted ceilings, high definition LCD TV, Direct TV, Netflix, a stacked stone gas fireplace, high speed wireless internet, a huge deck, a finished game room with a pool table, ping pong table & LCD TV. There is a king bed, queen bed, two single beds and a sleeper sofa. The very private setting is a wildlife lover's dream. Conveniently located near Stone Mountain State Park, Doughton Park, the Blue Ridge Parkway, Thurmond-Chatham gamelands, Yadkin Valley Wine Country, New River State Park, Olde Beau Golf club and many other mountain activities. For larger groups or if Serenity is not available, please see my other rental in the same development - VRBO#769614. I built Stone Mountain Serenity in 2008 and picked this location because of the amazing views, complete privacy, abundant wildlife and great hiking. Enjoying the breathtaking views while in front of a bonfire is one of my favorite cabin activities. Hiking Stone Mnt State Park and Doughton Park are other must do's while visiting the area. My boys love the rock slide at Widow Falls in Stone Mnt Park, which always ends with ice cream at the country store. There is nothing better than enjoying a cold NC craft beer on the deck, while watching an amazing sunset over the mountains...the uplighting can be mesmerizing at times. Touring all of the local wineries with friends and ending with dinner at the Harvest Grill at Shelton makes for a great day. This was a perfect place to enjoy the quietness and beauty of North Carolina mountains through fog, rain and perfectly clear nights with its ever changing views. The house was comfortable, nicely decorated and had everything we needed and more. A short drive away were many adventures: wineries, distilleries (notable Call Family in Wilksboro), bluegrass music and lots of unspoiled landscapes....definitely a place to return to. The house is amazing and has everything you need. The views are breathtaking. You have a little path you can hike to a rickety treehouse. The game room is very entertaining. This is definitely the place to unplug and relax. Tip - bring food as you won’t want to leave, plus dining out is a bit of a drive. We had a wonderfully peaceful stay at Serenity. The view from the deck was fantastic! It was the perfect place to sit and unwind. We found the house to be clean and inviting. It had the basics necessary for cooking our meals. As others have noted, it is best to bring all of your food and drink. The property description is accurate. We will definitely stay at Serenity again!! Stone Mountain Serenity will exceed your expectations. Stone Mountain Serenity is the ultimate home away from home with breathtaking views and inspiring landscapes. The decor strikes a perfect balance between modern touches and the warmth of what you would enjoy in a country home. Our perfect stay shared memories we will cherish forever. Had a little difficulty finding the place in the dark the first night though. We had a lovely stay at Stone Mountain Serenity over Labor Day Weekend. The cabin is beautiful and tastefully decorated. It is well stocked with plenty of entertainment options, including pool, ping-pong, TV, movies, and board games; kitchenware for cooking; a nice big grill, and firepit with firewood. Owners were responsive to our needs. Highly recommended. Conveniently located near Stone Mountain State Park, Doughton National Park, the Thurmond-Chatham Gamelands, the Blue Ridge Parkway, Yadkin Valley Wine country and many other mountain activities. $125 housekeeping fee, 7% tax and $200 refundable security deposit. Holiday and Event weekends are subject to a rate change. We accept VISA and Mastercard via Paypal, personal check or use the BOOK IT NOW feature on the website. Bookings canceled at least 30 days before the start of the stay will receive a 100% refund. Bookings canceled at least 14 days before the start of the stay will receive a 50% refund. Bookings canceled under 14 days before the start of the stay will not receive a refund.